Nowadays, couples are spending just as much time and attention on the pre-wedding festivities than they do on the wedding. And with good reason! Oftentimes the pre-wedding parties are just as enjoyable, and even allow the bride and groom to relax before the big day. This is why you need to peruse our incredible selection of engagement party invitations, to get the ball rolling! Here at Polka Dot Design, we understand the importance of the bachelorette party—the final night of fun and freedom with your girlfriends. For this reason, we have a vast assortment of bachelorette party invitations perfect for any occasion. Or perhaps you're skipping the bachelorette fiesta, and keeping things simple with your friends and family. 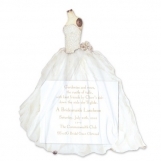 We also carry bridal luncheon invitations, for any bride looking to celebrate in style. We proudly serve up an arrangement of invitations surely to fit any and all party needs. Take our rehearsal dinner invitations, for example, a gathering often overlooked by most. Or our ever-popular bridal shower invitations, which showcase the beauty and whimsy of this memorable occasion. Here at Polka Dot Design, we want to cover all your invitation needs, so that you can just focus on the fun. Save up to 20% or free shipping on online cute Pre-Wedding Parties at Polka Dot Design Design. For more information, contact us at service@polkadotdesign.com or call the Polka Dot hotline 1-877-816-0884.